Die Agentur Smith-Harmon hat zahlreiche Beispiele für kreative E-Mail-Designs gesammelt, kommentiert und als kostenlose PDF-Datei veröffentlicht. Auf 23 Seiten gibt es jede Menge Inspirationen und kreative Beispiele für das eigene E-Mail-Design. The Smith-Harmon team reads tens of thousands of emails each year to stay current on trends and gather new ideas to give our clients an edge in the inbox. 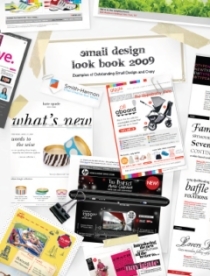 We’ve assembled 20 B2C emails from the past year that really stood out in the minds of our staffers and compiled them into the first annual Email Design Look Book.